I think I've posted a picture of this guy before...but I am so excited about all the green things popping up that I just needed to put him up again. 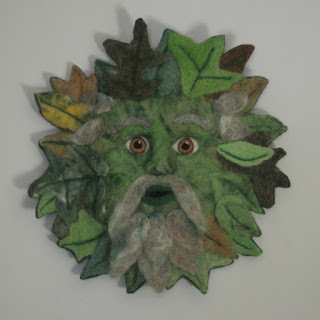 He's needle felted onto a backing made of a recycled sweater; each leaf was individually felted and then felted on to his face, and then the details were added. I'm working on two big projects right now: the braided rug I've mentioned before, and a green man in Fall tones. So far the Fall Guy is just a few leaves, but I can't wait to see more of him develop. I love your Green Man and of course your name ...If you read my blog ..I explain about why I called myself woolbrain...I'm so glad you have wool on the brain:) I too homeschooled...lovely work . Hi! I definitely have wool on the brain, in all the ways possible! Happy Etsying!